Detail of Icosahedron Within a Dodecahedron from The Platonic Solids Duals, 2016. Courtesy of the artist, Athr and MOCAD. For Dana Awartani, a Palestinian-Saudi artist who lives and works in Jeddah, Saudi Arabia, geometric patterns express both the rational and the spiritual parts of us. Using mathematical principles, numerically devised symbols, and traditional Islamic patterning, Awartani creates paintings, installations, sculptures, performances, and textile works that are as rich with meaning as they are beautiful, elegant, and precise. 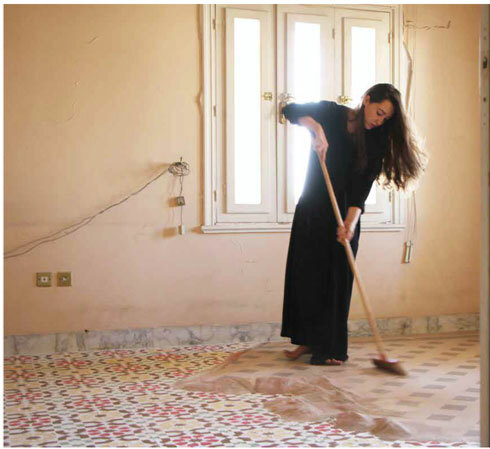 Awartani situates her artistic practice at the juncture between tradition and the now. Though her forms, methodologies, and interests are largely rooted in the study and understanding of traditional Islamic forms, Awartani is also keenly interested in the translation, translocation, and transformation of these forms into our contemporary, global world. Though the forms explored in Awartani’s artworks are derived from Islamic traditions, part of her interest in these geometries is that they are also universal. 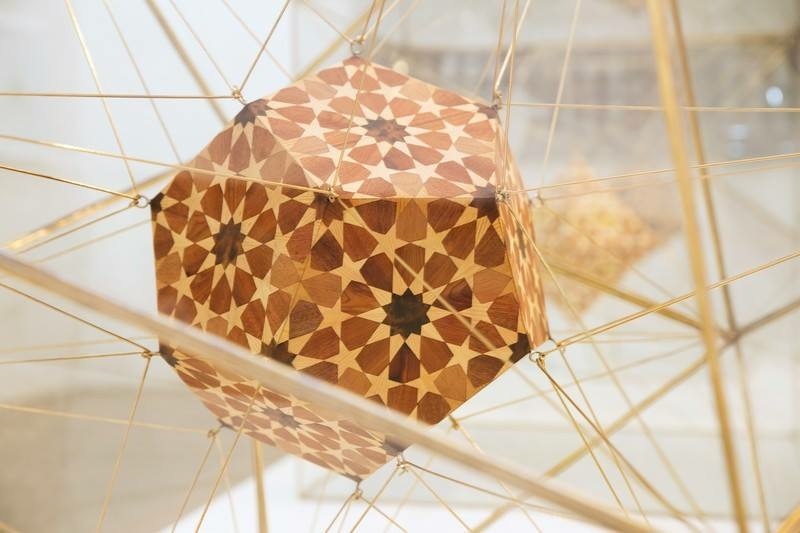 Borrowed from and reflected in nature, present in the religious iconographies of many global religions, and reliant upon the rules of mathematics, Awartani’s geometric patterns can be interpreted and appreciated through many different lenses. Striking a careful balance between the conceptual and the technical elements of art practice—Awartani pursued both conventional contemporary fine art as well as traditional arts as a student in London—, Awartani creates hypnotic visual stories that exist in that rich territory between abstraction and representation. In Awartani’s visual world, the curve of a line or the number of points on a star convey specific meanings. Her paintings and installations echo traditional Islamic artworks, which use complex geometric patterns to symbolize the Divine. In the traditional artworks that she aims to revive for our contemporary era, each color, line, shape, and flourish is part of a story; in Awartani’s works, this symbolism remains and is expanded through her own innovations. While so much of her practice focuses on revitalizing the neglected methods of traditional Islamic art, Awartani is not content to replicate the ancient in the present. Her works consider issues relevant to our contemporary moment—like gender, religion, faith, and loss— speaking of the present through the visual language of the past. Still from I Went Away and Forgot You. A While Ago I Remembered. I Remembered I’d Forgotten You. I Was Dreaming, 2017. Courtesy of the artist, Athr and MOCAD. Detroit Affinities (exhibition), Detroit Speaks (education), and Detroit Stages (performance). This multi-year research program is one of the most ambitious undertakings to date at MOCAD. DETROIT CITY is supported by the Ric & Suzanne Kayne Foundation and the John S. and James L. Knight Foundation. Exhibition support is provided by the A. Alfred Taubman Foundation. Our 22,000 square foot historic venue is available to host just about any occasion.